A new public procurement law is being planned by the government to reduce the tendency of public departments to split up service contracts, thereby avoiding the need for tendering, the secretary for economy and finance clarified yesterday during a plenary session at the Legislative Assembly (AL). The law would also seek to redress a lack of transparency in public procurement practices through implementing a “standardization of procedures” and “more specific directives,” Lionel Leong said. The secretary had previously hinted that there could be an impending revision to the public procurement law, which has been unchanged since before the handover. He cautioned, however, that no revision to the law would take place before consultation sessions with both the public and relevant government departments. Also under consideration is a raise to the maximum service contract worth that can justify the avoidance of a public tender. Currently, service contracts worth more MOP750,000 or more must go to tender, as must project contracts worth over MOP2.5 million. “We believe that the increased thresholds will prevent government departments from breaking up service contracts into smaller ones,” the secretary explained. 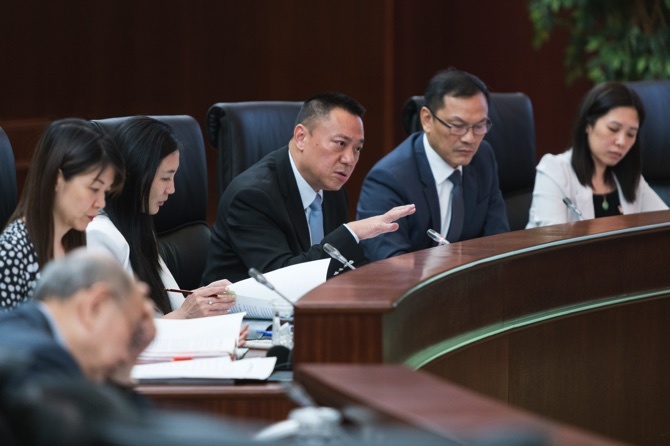 Moreover, a new public procurement law would give greater priority to small- and medium-sized vendors in the city, as well as bidders that offer environmentally-friendly products and services, he said.